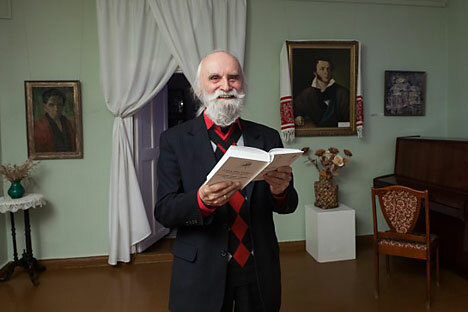 Boris Yegorov, a literary expert and the director of the Arkhangelsk Literature Museum, has collected and published 210 translations of Pushkin’s poem I Still Recall the Wondrous Moment. Yegorov’s painstaking correspondence with many people who could help in translating the poem lasted four years. He used both diplomatic and personal ties in the project: Russian Foreign Minister Sergei Lavrov was one of the most active supporters of the idea. 140 of the 210 translations were completed especially for the literary museum. Yegorov relates how he asked a representative from a small indigenous tribe in the north of Russia to translate the poem. He received the reply that their language did not have the concept of a “wondrous moment,” so it was impossible to translate the poem. “I tried to convince him that there must be something similar in his language. Something like, ‘Still I remember you appear/ Before me like an aurora fleeting …’ Three weeks later I received the translation. Yegorov has many such stories. For example, to get a translation into Bribri, representatives from the Russian embassy went to a Bribri reservation in southern Costa Rica – an unlikely location to hear Pushkin read aloud. The poem was translated into many exotic languages, including Guarani, Quechua, Maya, Māori, Pushtu, Sango, Fang, Hindi and plenty more. The book’s print run is 4,000, and it has attracted interest inside and outside Russia – one of the first orders came from Indonesia, for example. QUIZ: Which character are you from 'Eugene Onegin'?